We make our annual departure from birds to hear a talk by Mark Eustace of the Chesterfield Astronomical Society on deep space and the objects that can be found there – known as Messier objects after the 18th century comet hunter who created the catalogue of said objects. He will present fabulous photos of galaxies, remnants of super novae (exploding stars), stellar nurseries where stars are born and planetary nebulae taken using the famous Hubble telescope. 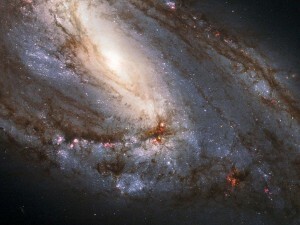 The photo shown is of a spiralled galaxy named M66 and is 35 million light years away. In other words we are seeing it as it was 35 million years ago, quite a mind boggling concept. Guests are always welcome to our talks so why not come along.